The issue opens with a story about Japanese girls making balloons to carry bombs over the Pacific to America. The story continues on to Hailey’s circus, where a member of the Court of Owls is chosing a new Talon, a girl caught in the bombing. 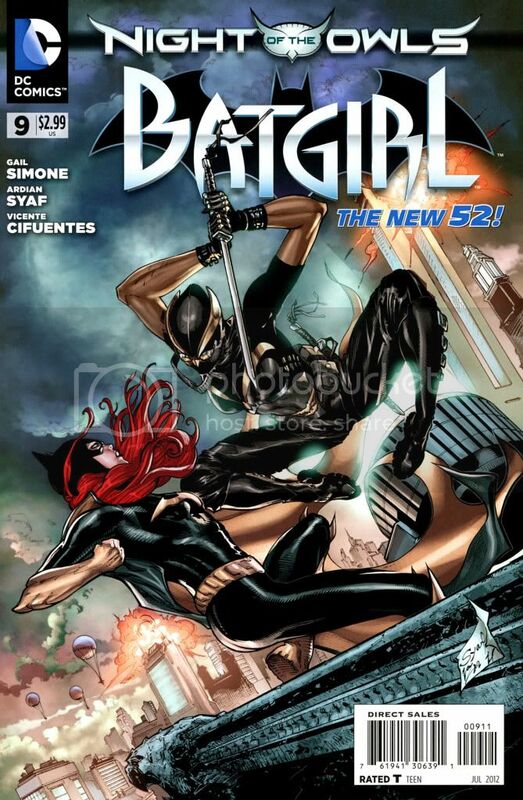 Cut forward to the present and Batgirl faces off against the Talon the girl in the story would become. She barely manages to fight the Talon off. Gordon is approached by the Court of Owls and forbidden from acting against them, at risk of harm coming to Barbara. While Batgirl faces the Talon and defeats her, Gordon finally makes his way up to the roof where he activates the batsignal, only to discover that is what the Court of Owls wanted him to do all along, having replaced the batsignal with their own signal. Doing the rounds on other review sites I’ve noticed that a few of them have been down on this series. While I can understand why, Batgirl has yet to wow me completely, I think this issue at the very least was an entertaining read. The ominous ending bodes well for how it ties in with the rest of the event, though speaking after reading the other issues I have to say that it does not really come up again. Which smacks of a missed opportunity. Unless of course it happened in one of the few Batman books that I’m not reading. As a contained story it works just fine. I’m not entirely sold on multi book events in comics, mostly because it takes what should be a complete story and fragments it into something told by multiple writers, some of whom don’t seem to communicate with each other. To comment on the event as a whole, none of the other books really matter to the overall story. The driving force is in Batman and all the other characters are reduced to one off fights against whichever Talon they are matched against. The interesting part of this issue is definitely the Talon. Each other issue in this event focuses on a backstory for whichever Talon the character has to face off against. Compared to those other stories I think I might prefer Gail Simone’s take on her Talon’s story most. For one the story is broken between the events of the fire balloons, and the Talon’s own past. I for one at least appreciated the first few pages because they led me to do a little searching to confirm if the balloons were a real thing. Turns out they were, also they were completely ineffective. With the exception of six people dead, which is itself a horrible tragedy, no major damage was caused by the over 9,300 balloons that were launched. So I’ve learned something about history. Thanks Gail Simone! But a comic is not a history lesson–unless you count the excellent history of Switzerland I read in school and am still trying to track down–so how does the story itself stand? It stands well enough on its own, though the sterile nature of the books sticks out. This is a complaint I have about all of the Batman books, the titular character of each book is the star, often resulting in being the only character from the bat family featured. Crossovers are rare, and even a major event like this segregates the characters into their own books. This would be a perfect opportunity to see the cast interacting with each other, but instead we get a collection of one off fights. An entertaining read, but one that could have been more, though that itself is a fault of the event as a whole and not the individual book.